For those of you old enough, can you remember saving your pennies so that you could buy a Selmer Zodiac amp because it had an inbuilt tremolo effect. It was the mid-1960s. Tremolo effects had originally arrived in the early 40s. In the 50s Muddy Waters did a few tracks with it and then… along came Bo Diddley. And, we all had to have this ‘new’ sound. Bo produced a series of records with that distinctive sound of his, and the tremolo became part of our existence and musical culture. They are a bit more sophisticated these days but are still as exciting to listen to and use as ever. So, Is It Time To Go Back To The ’60s With Some Tremolo? How Will You Use Your Tremolo Pedal? Keeley boss and pedal designer extraordinaire, Robert Keeley has been active in the design of this pedal which brings some new ideas to the table. We are all familiar with the basic tremolo sound, and in the early days, it was so easy to set it up and play without considering the effect at all. Tremolo can be ethereal, even ghostly; it can even be shattering in a high volume situation and everything in between. This pedal offers you three operational settings and within those settings four separate waveforms. That gives you a lot of potential sound options. The name ‘Dynatrem’ has a very 60s feel about it but don’t be confused. The ‘Dyna’ refers to one of its operational modes. This pedal responds to your playing style and how you play will determine the rate and depth of the effect. It is dynamic. Play hard, and it responds with a more aggressive effect. Play in a softer style, and the sound will relax with you. That is a very clever concept. A further sound option is a harmonic tremolo; in this mode, you can bring in reverb using the shape control. The shape control is also used to define which of the four wave-forms you wish to employ. Included are a noise reduction facility and volume control for output. The pedal is true bypass so you won’t lose any of your tone when it’s not in use. It is well made and tough for use on stage with easy to use controls. 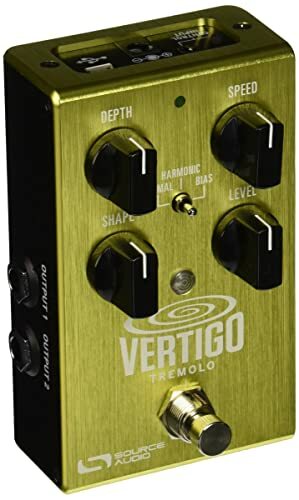 Price wise it is not at the very top end, especially considering it is an exceptionally good tremolo pedal. Dynamically works with your playing style. 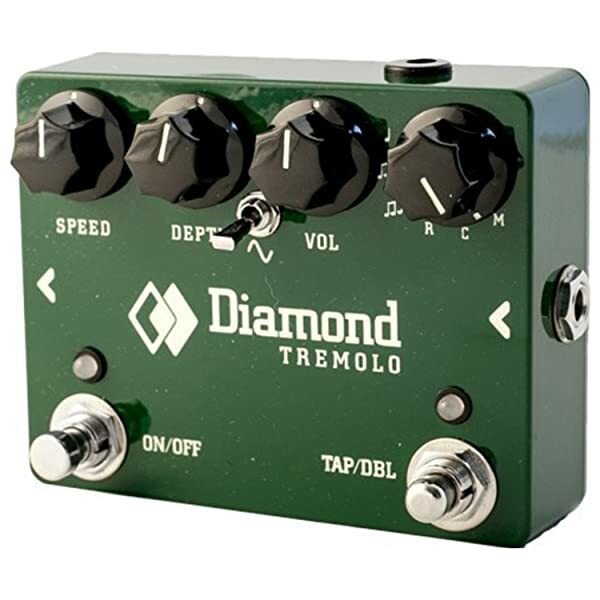 Some will not like the dynamic tremolo feature. Lots of technology in this pedal so if you are a little bit ‘techy,’ you will love this. The Latitude gives you four separate time divisions, a waveform selector and further controls for attack, speed, space, depth, and level. The waveform options include peak, sine, and square. Expanding the operational possibilities further, it has multiple time divisions and a tap tempo facility allowing you to sync it with whatever tempo you need. There are four subdivisions of settings accommodating triplets, dotted eighth’s, eighth’s and quarter notes. They have used digital technology to create analog sounds some of which will take you back to the ’60s while others are bang up to date with modern Tremolo uses. It is well made and rugged but to be honest we are not sure about the facia design. Yes, it is ‘cool and trendy’ but is it functional? On a brightly lit stage, yes, but in usual stage semi-darkness will you be able to look down and read the options quickly? Does look nice though. The sounds the pedal produces are wide-ranging and very impressive. It is going to take some getting used to we think, as there are so many options at your fingertips. But, if you are willing to invest the time, then the options are almost endless. 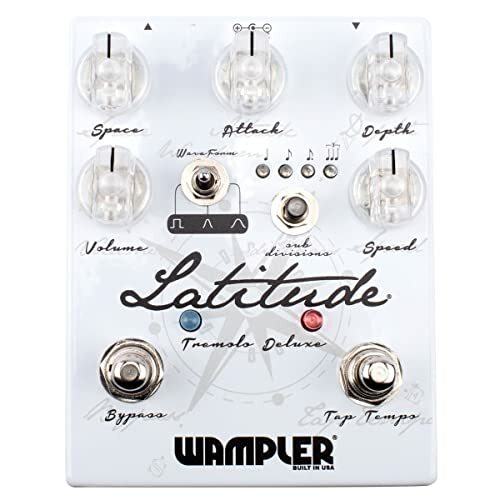 Having a tremolo is a worthy option on your pedalboard, but if you want one that will give you something special, then it could be the Latitude. 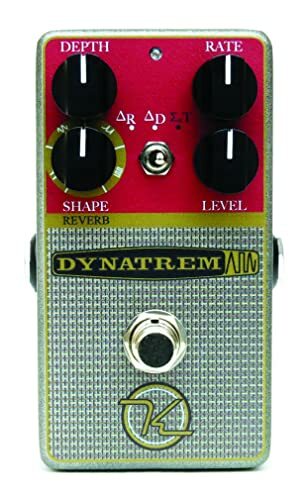 Quality rarely does quality comes cheap, and neither does this pedal, it is at the top end in terms of price. Tap the pedal for setting the tempo. Fascia design may not be stage friendly. Fulltone have produced a Tremolo pedal that raises the bar. Packed with features, some standard, others new, and it will give a huge stereo sound. It comes with the usual array of effect options. Waveform, mix control, and tap tempo are available, and it offers true bypass. Phase Correlation controls the phase of the outputs. It also comes with its own 18v power supply. But there it goes up a level offering an accurate stereo reproduction. No need to go too far into the technicalities, suffice to say it is created by having two identical circuits that run together producing a real stereo effect. The waveform option has some unique features as well. You can choose between the usual sine and square, but it also includes Fulltone’s ‘warble’ sound. Perhaps the only way to describe it as being a bit like a Leslie cabinet. It delivers a big tremolo sound and delivers it in stereo. The range of sounds created is quite surprising, and it will produce just about anything from the modern day sounds to those simple, but charming 60s efforts. It’s robust and made to be ‘road tough,’ as well as, being designed to be used on stage with easily visible controls. This tremolo pedal by Fulltone has a lot going for it. It has been designed and manufactured to raise the bar in quality tremolo pedals. This is not your ordinary tremolo pedal and offers a lot of features. It will take the user some time to understand what it is capable of and it will be time well spent as it offers a lot. Of course, it does not come cheap, and this may put some people off. Excellent control of the phasing and timing. Will take time to get to know it. No review of effects pedals in any function is complete without seeing what Boss is producing. To many, they produce the best pedals that are easy to operate and not overly expensive. They may not go in for some of the fancy stuff, but one thing can be said about them, they get the job done. 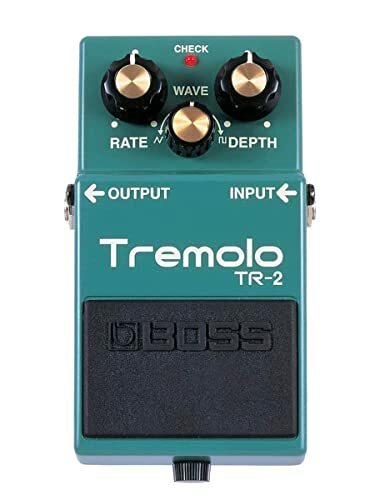 The one thing that has always impressed us about Boss pedals is that over the years the functional design has hardly changed and the TR2 is the same. Featuring the usual strong outer casing with the standard heavyweight push down pedal, it has been designed and built to last. It is not complicated to operate. 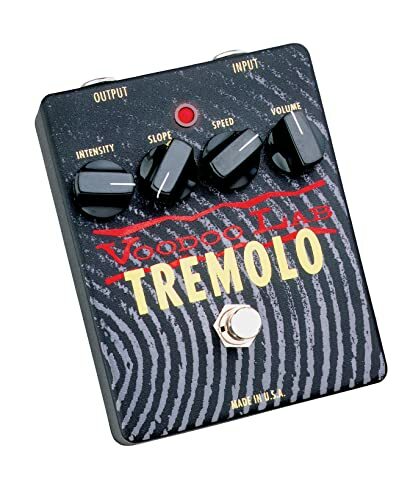 It says to you, you want tremolo, here it is. Boss has a reputation for simplicity with excellence. Welcome to the TR2. If you want a tremolo pedal with nothing fancy that will give you the base sounds and do it simply, and very well, here it is. Control wise you can adjust the speed of the effect and the depth that the volume dips, and there is also a waveform allowing a choice between triangular and square sound formation. If you want to produce basic tremolo, that’s all you need. For such a simple pedal it gives a great sound and a huge range of options. Yes, you will find pedals that have a lot more options and frills, but Boss is not in that market. Put simply; they get the job done. Tagged with a price that is more than realistic, this pedal represents a fantastic option. Boss Simplicity of design and use. Some may think it has limited options. Welcome to a tremolo pedal with enough bells and whistles to keep you occupied for a while. And by that, we mean that it really will keep you up late some nights. On the face of it the controls look easy to manage, but in some cases, they have more functions than are initially obvious. There is a speed control allowing you to change to the rate of modulation from extremely slow to very fast. The depth control gives you your choice of the intensity of the modulation from a very gentle sound to a rather threatening in sound, pulsation. The volume is about the only control that doesn’t come with its own manual. The tap tempo button allows quick and accurate changes to the tempo but then when held down will double the tempo you have chosen. The mode control offers six different options for you to experiment with and while you are doing that the waveform switch will encourage you to experience four different waveforms. We could spend the rest of this review just explaining the controls, but it is more important to know what this pedal actually sounds like. As you might expect, its analog sound is impressive. And, there are so many tonal options on offer that it would be hard not to find one that actually suits what you want. This pedal has just about every bell and whistle you could find and a few horns thrown in as well. It is remarkable technology, but from a practical point of view, it will take some time to get familiar with it and do you want to spend all that time learning exactly how to get the best from it? If you are? Than this pedal will offer you a lot. Price wise it’s quite expensive. An endless list of sound options. Some may find it just too much effort to use. This is a pedal from Voodoo Labs that attempts to bring you a quality pedal with good features that will not break the bank. 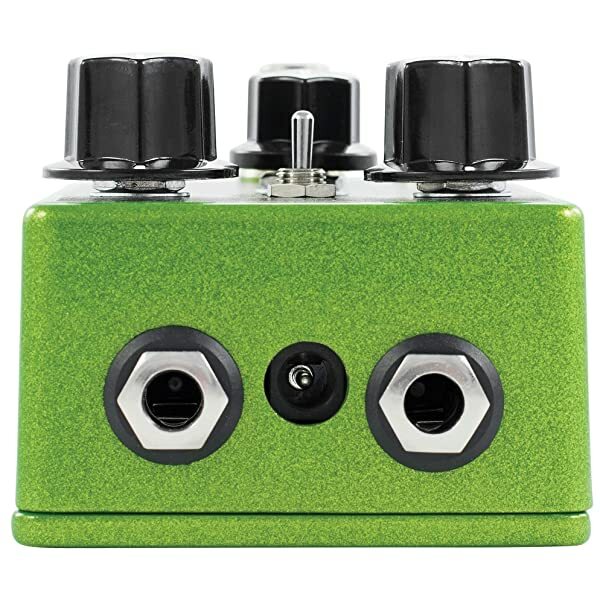 The company has not tried to develop an all-conquering pedal; rather, they have designed a pedal that will do the basics and do them very well. They have succeeded, and the sound options are good, while the pedal is reasonably priced. It has four basic controls that are easily visible on the unit. The intensity control is the depth of operation, i.e., how deep you wish the signal to travel. 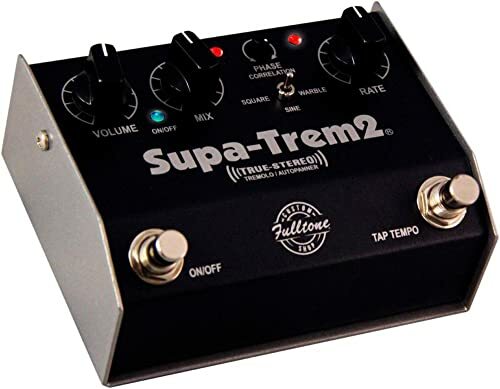 The slope control does what it does and will vary the sound from original tremolo’s and their dreamy sounds, to the more modern staccato varieties. The speed of the effect and the volume are self-explanatory. Simply set up, simple to understand and use, but how does it perform? Very well is the answer. Considering that the controls and options appear very basic, they create more than enough potential options for a great sound, than might be immediately apparent. It has set out to recreate the analog sounds of a vintage amp and has succeeded. And produces a classic sound and is able to blend its effects to produce a quality you might expect to find in a more expensive pedal. This is a pedal that does not try and push the boundaries of technology; it does what it does and performs the task well. Certainly worth considering for those wanting a great sound but want to be able to create it easily and with little fuss. It is priced in the middle of the range. Great design that is easy to use. Some may want more features for the money. So, can you reproduce the sound of a bygone age when music all seemed so simple? Some might ask, why would you want to use an old effect like tremolo? But, the reality is that those special sounds are part of the modern musicians DNA. For those of us old enough, the sounds were inspiring to us as we took our first musical steps. The early guitar sounds utilized by Jan and Dean, the Beach Boys and others owed much to their use of tremolo at a time when guitars were rather bereft of different sounds and other effects. Built into Fender amps and later others, the Tremolo sounds were then picked up by bands like Creedence Clearwater and The Doors and used to good effect. Of course, that is not the only sound the UT300 produces but its near-perfect recreation of sun, sand, and innocence is excellent. If you love those iconic sounds, you are going to love this pedal. The three major controls dictate the rate, depth, and wave of the sound allowing you to shape it to your needs. It is well made, though the casing is plastic. It is quite tough plastic but won’t be as rugged as its metal-based competitors. Simple and easy to operate it does its job and with the ability to make some really authentic noises from days past is worth looking at. It operates on a 9v battery. Don’t be fooled by the cheap price tag. Behringer is very good at making good quality, competitively priced equipment. Produces some great retro and modern sounds. The plastic-based cover might be a problem on the road. 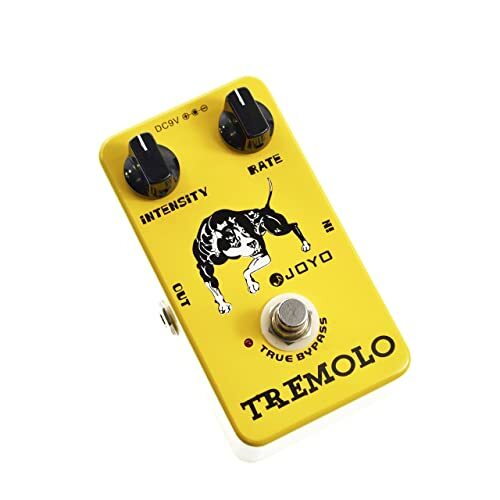 Joyo makes very good cost effective pedals, and this tremolo is no exception. Once again it draws its inspiration from the tremolo sounds of the 60s using an optical circuit as was used in the original effect in Fender amps. Its very simple controls allow you to create the sound you want quickly and without fuss using the intensity and rate controls. It will deliver a very gentle sound wave for a distinct ambiance up to a very modern staccato chop. A useful feature is that it has an LED light that flashes at the current speed setting allowing you to make quick and easy adjustments if necessary. It has a true bypass so there will be no signal loss when turned off. Joyo pedals are well-known for being inexpensive but still with some quality. Don’t let the price tag make you think it cannot be any good; it is a decent pedal. It is basic and doesn’t have some of the features the more expensive pedals offer, but perhaps you don’t need that. However, it does create a nice sound especially with a slow setting and is reminiscent of a very early tube amp effect. It has a metal casing that we have to admit, doesn’t look that strong and rugged, but being a metal construction is likely to put up with some usage. It uses a 9v battery or an adaptor. 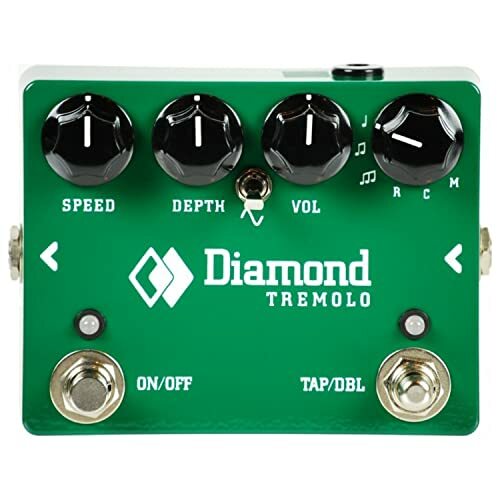 If you are looking for a very simple, easy to use tremolo that will deliver a nice sound, then this is worth considering, and at the price tag, you really can’t really go wrong. The cases construction strength may be a worry. Earthquaker does deliver some shatteringly good pedals. 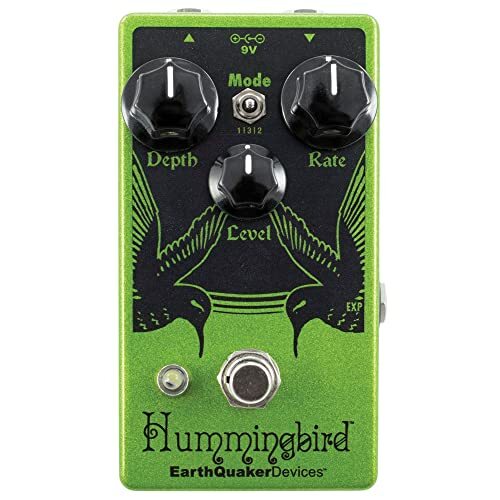 You always expect something different from their designs and operation so welcome to the Hummingbird v4 tremolo. Once again a pedal manufacturer has taken their basic inspiration from the 50/60’s period, and this pedal mirrors the early Vox sounds. It doesn’t stay in the past very long however and with a tweak of the controls drags you into the modern day tremolo sounds. The controls are easy to use with depth and rate performing the obvious functions. The level control is actually the volume. At the pedals center is a toggle mode switch, which allows you to select the oscillation range between slow, medium and fast. The controls do operate other useful functions, one of which is that if you cut the level down to zero, the pedal gives you a clean boost. It has a lot of inbuilt options that allow you to create the sounds and the presence you want. As well as all these options, it also has a big sound, and the variations achievable in tremolo sounds are very impressive. If you want a pedal that gives you the sound and then gives you much more on top, this is worth a look. With its tough, sturdy build, this pedal is ready for most of what you can throw at it. In fact, when the effects kick in it is likely to throw something back at you. It is loud and powerful, but when set at the quiet end, it has a certain nostalgic sweetness. It’s in the mid-price range making it a very good option. Powerful pedal with many sound options. Might have too many options for someone wanting a simple tremolo pedal. If you are not familiar with Source Audio they produce brilliantly designed effects that do not appeal to the… how can we say it… ‘non-tech’ minded individual. Who will look like they have been confronted with the Large Hadron Collider. Rarely simple to use, but with just stunning effects and the potential to go where few other pedals even contemplate going, they are a techno delight. Change has come though with this pedal. The ‘non-tech’ can actually get a slice of the action. At first glance and if you want to keep it simple, this pedal will give you some great tone ranges and sounds. It includes the option to keep it very simple and create that haunting Vibrato effect from early Fender amps. The basic controls are easy to operate. Depth and Speed doing the usual job, Shape adding some varied but basic options and Level controlling the volume you require. You can connect to Source Audio’s free Neuro Mobile App where you will find an absolute plethora of sounds from the library. All of which can be uploaded to the pedal. Just before the ‘non-tech’s’ run from the room, you also have access to a whole new set of parameters including wet/dry mix, stereo separation, and parametric EQ. When linked with Neuro Hub it is fully MIDI compatible offering a further 128 presets. This pedal will give you more than just a bit of tremolo, but it will take some understanding and some work — an amazing piece of technology that is quite frankly cheap at the price. Great basic sounds that are easy to use. Amazing options for those wishing to explore them. Might be just too much tech for those just wanting a simple tremolo pedal. Well, it has come a long way since then, but those original sounds brought forth a whole set of ideas about what could be done with extra effects added to instruments. One thing that is very apparent from undertaking this review is that the original sound is still loved by many and most of the pedals we looked at made attempts, with greater or lesser degrees of success, to emulate and recreate it. Our minds go back to 1964 and going to a local club, The Railway Hotel in Harrow, West London to hear the resident band, The High Numbers. In one song the guitar player threw the volume full on, boosted the treble and hit a chord with an ear-shattering tremolo that bounced in and out of our heads. They became The Who; the pedal became the tremolo. As per Mr. Townshend, shattering, as that was, or gentle for a more subtle effect. To add an ethereal feel to a solo or to oscillate rhythmically with the tempo of the song. This pedal, although taken for granted by some, will create some great sounds. Whatever you wish there is certainly a pedal we have looked at that will do the job for you. You have the choice from our list. There are the very plain, just do the job pedals, to those that incorporate various extra options for sound shaping and creation. There is even a pedal that probably handles more tech than Neil and Buzz took to the Moon. The fun is finding out how you will use it, and that is up to you. Only you will know what you want to achieve but don’t close your eyes to the possibilities. These pedals are all superb in their own right, but some of them offer so much more. So many options, but we had to make a choice. We decided we didn’t want something too technical. Easy to use, simple to control quickly but with great sounds at our fingertips. It needs to be robust for ‘stage-use,’ and we didn’t want to spend a fortune on it. Has everything we need at a great price, and with Boss, you know exactly what you are getting.